Essay topics: The two maps below show road access to a city hospital in 2007 and in 2010. The two maps compare roads linking to a city hospital as well as transport facilities around in 2007 and in 2010. It is noticeable that the Hospital Road had been reconstructed with two new roundabouts. Meanwhile, the bus station and parking lots had changed considerably. Looking at the maps in more detail, we can see that two roundabouts hab been built at both ends of the Hospital Roads, one was placed on the junction with City Road and another was put on the intersection with Ring Road. These two roundabouts were linked to the new bus station, which was moved to the left side of Hospital Road. The old bus station that along Hospital Road was no longer available. It also can be seen in the maps that a new car park was built on the right side of the City Hospital. Citizens can park their private cars at this parking lot, while the old parking lot was only access to the staff of the hospital from 2010. The two maps compare roads linking to a city hospital as well as its transport facilities around in 2007 and in 2010. Looking at the maps in more detail, we can see that (Just describe the graphic. don't write about your looking at it. The professor knows what you are looking at.) two roundabouts hab been built at both ends of the Hospital Roads, one was placed on the junction with City Road and another was put on the intersection with Ring Road. These two roundabouts were linked to the new bus station, which was moved (It did not move. Moving only applies to things that exist.) to the left side of Hospital Road. The old bus station that along Hospital Road (Bus stops do not constitute a bus station. "The bus stops on the east and west sides of Hospital Road were removed and replaced by a new bus station. The entrances and exits to the bus station were linked to the roundabouts, which gave access to Ring Road on the north and City Road on the south. " ) was no longer available. It also can be seen in the maps that a new car park was built on the right east side of the City Hospital. Citizens can park their private cars at this parking lot, while the old parking lot was only access (wrong form. ... the old parking lot was limited to hospital staff..) to the staff of the hospital from 2010. Between those two years , the Hospital Road had been reconstructed with two new roundabouts. There were improvements to the facilities for both public and private transportation. 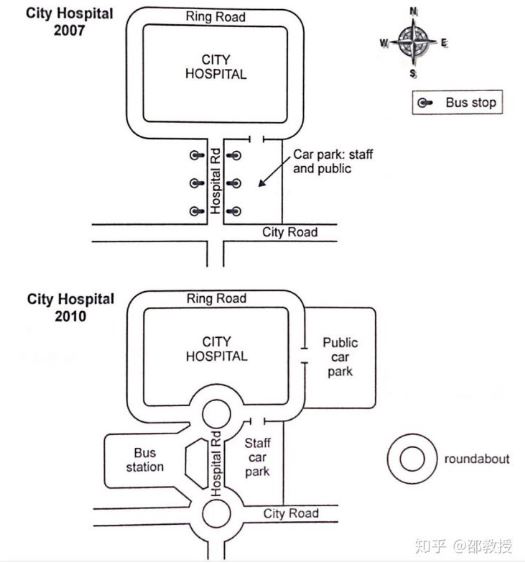 Two roundabouts had been built at both ends of the Hospital Roads, one was placed on the junction with City Road and another was put on the intersection with Ring Road on the south. The bus stops on the east and west sides of Hospital Road were removed and replaced by a new bus station in the southwest. The entrances and exits to the bus station were linked to the roundabouts, which gave access to Ring Road on the north and City Road in the south. A new car park was built on the right east side of the City Hospital. Citizens can park their private cars at this parking lot, while the old parking lot was limited to hospital staff of the hospital from 2010. So now there two time more space for cars. Sergiy Konchenko, are you giving feedback to Cobra Park, or are you asking about your own version of the essay?